The Metta Sutta, the Buddha’s discourse on loving kindness, is a key teaching in the Pali Canon. It is chanted by Theravadan monks throughout the Asian southeast. 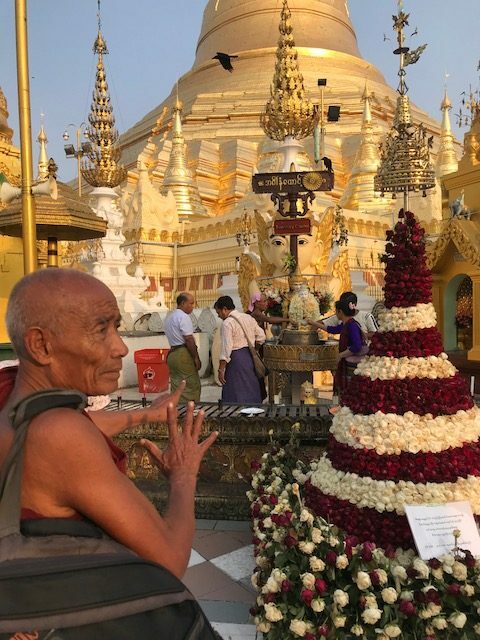 A Theravadan monk at the Swedagon Pogoda in Yangon, Myanmar. During my recent visit to Myanmar, the social-activist monks Ashin Issariya and Ashin Kovida both guided me to the Metta Sutta. So did my instructor at a one-day Vipassana meditation course where I joined more than 100 Burmese men and women in their practice. A neighborhood monastery near my hostel had a loudspeaker on the street. It probably was broadcasting the Metta Sutta. I was in Myanmar to study the influence of Buddhism on the tragic situation of the Rohingya refugees. How could such human suffering arise in a country that is 88% Buddhist? The experience was a reminder that the earthly realm is filled with confused causes and conditions — spiritual, ethnic, economic, political — and that the Buddhist world is not exempt. But the Metta Sutta is clear. It resonates for me as a Shambhala warrior. Below, for you to visit, is a particularly lyrical translation. Thanks for this lovely reminder ..